Lots of cars still seem to have rego stickers on them, even though they are being phased-out — you haven’t needed to have one on your car since the end of last year. …from 1 January 2014, Victoria will abolish registration labels for light vehicles, including passenger cars. How will people know when they need to pay registration? Although registration stickers will be no longer issued, there will be no change to the traditional reminders which car owners are used to receiving. 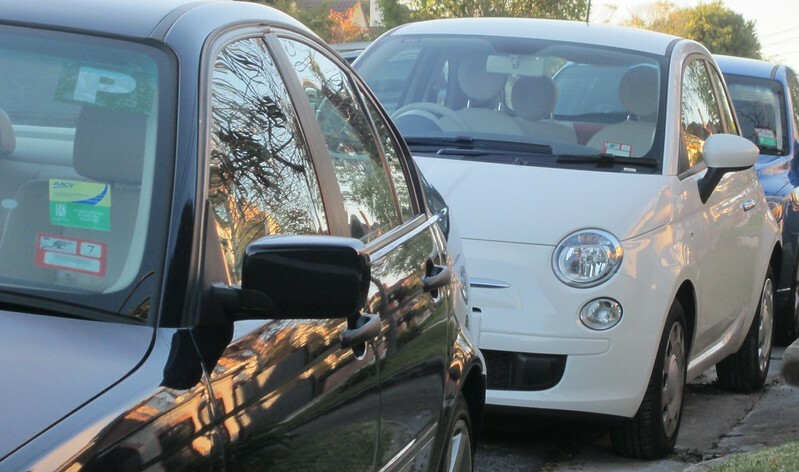 VicRoads will continue to send vehicle registration renewals notices around six weeks before registration is due, and a reminder letter will be sent if registration is not paid by the due date. They also note that most other states have either already abolished registration stickers, or are about to. Given it’s May and many more than half of cars still seem to have them, I assume many have expired but not been removed. I peeled sticker off a few weeks ago, well after it expired. It took quite some time to remove completely, but on the bright side, I guess I’ll never have to do that again. I’ve kept my sticker, and added my own label to it, to tell me when the registration runs out. Just like the sticker has always done. I would have been happy if they’d just said, “We will no longer book you for failing to have a registration sticker on the window, but we will still give you one so you will have a reminder sitting there in front of you every time you look at the car.” But instead they stopped printing them. For light vehicles only. All heavy vehicles and trailers still require them, and the printing process still runs. It just doesn’t run for our cars. The money saved equates to 12 cents per car, and the registration bill is still printed on the same paper, but without a label stuck to it. I predict a surge in the number of motorists booked for driving unregistered vehicles because they have forgotten to pay their registration bill or it has simply not arrived in the post, and they haven’t had a sticker on the window with a big number on it, reminding them that their registration expires in a certain month. After noticing that new cars didn’t have stickers I looked into it and found they were no longer required, but the first time I received anything about the change was on my renewal notice. I didn’t hear about it from the news or similar. Daniel, if I was buying your car, how can I establish when the rego truly expires? You can contact VicRoads (using their website or an app they have yet to create) to ask when the registration expires. But it doesn’t matter (to the government) if you can’t tell. All that matters (to the government) is that the police have a system in place for checking the registration database in the field, so they can fine you if the car is not registered. Which they do. Note that the ‘reminder letter’ sent by VicRoads, if a registration is not paid by the due date, is in fact a reminder that the car is now unregistered, and the owner will need to obtain a roadworthy certificate and register it again. There is no grace period for registration renewal – this was eliminated several years ago. @philip 12c a car adds up to a substantial amount of money – purely to provide an additional reminder to the owner that their rego needs to be renewed. In theory. (I never look at the rego date on the sticker now, so wouldn’t notice anyway.) Do you think that insurance companies should produce stickers for your house and car to remind you to renew your insurance? Perhaps you want a personal sticker to remind you to renew your drivers license? Personally, I think that it’s good that government agencies are stopping doing things that cost money and provide little benefit. Incidentally, when I forgot to renew *my* rego about 18 months ago, the reminder notice was exactly that. It politely informed me that the rego was outstanding, and gave me a grace period to pay it – and I could pay it immediately over the telephone. No need to get a roadworthy or reregister the car (although I would have had to if the grace period had expired). And, yes, if I had had my rego checked I would have been charged with driving an unregistered car. But that would have been my fault. 12 cents a car adds up to 12 cents a car. Or if you like, $600,000 a year out of about $1 billion in registration fees. My licence does indeed show its expiry date on it because there is an offence attached to failing to renew it. Has your insurance company ever fined you for failing to renew your insurance? Does it constitute an offence if you fail to renew insurance? What I’m illustrating is that this is a measure that in fact cost *little* money and provided a benefit that will become apparent to people once it affects them. Most of the people, most of the time, won’t be affected. But when all the holes in the cheese line up and it turns out that one of the holes has been eliminated with the abandonment of stickers, the victims of it will be annoyed. This was a useful reminder to drivers that the car was (or wasn’t) registered and that its expiry date was X. It is simply because the police now have another way of checking registrations that the stickers have been eliminated. If all they wanted was to increase convenience by removing the hassle of applying stickers every year, they could have simply eliminated the rule that made it compulsory to display the sticker, leaving everyone free to use a sticker if they wanted. Probably not the answer you want Philip, but you can always bung your own PostIt note or whatever on your windscreen as a reminder. For me, the letter from VicRoads is reminder enough. I won’t miss struggling to peel off the old stickers. The peely-sticky rego sticker was an innovation! Before that it was a slide-on transfer that then had to be scraped off and flaked everywhere. We’ve not had rego stickers in South Australia for a few years now so I can offer some feedback – it’s causing all end of hell. You see, we don’t get reminder notices here – just the renewal. That’s it – one letter. When you combine Australia Post’s famous inability to deliver mail (where the hell does that extensive amount if lost mail go?!?!?!?) with the ease people forget a single justice, lots of people are accidentally becoming unregistered. And as predicted, the fine for being unregistered was heavily increased. So over here it’s generally considered to be an intensional effort to sabotage and fine the public. Forgot to mention, there was a court victory last week where someone was fined when the cops discovered they were unregistered. Their single renewal notice went to a wrong address and, with no other obvious way to know when you are lapsing, where unaware they were over. The government claims you can look it up online – but why the hell would you suddenly randomly do that during the year? Court ruled the driver would have happily renewed if they knew and fine overruled. Government’s response when asked if they will rethink how unobvious it is that rego is due – there will be no changes. Precedent has now been set in the legal system so no doubt every man and their dog will challenge this if they find themselves unregistered. Hmm. I had a car whose renewal date was December. They sent me a sticker, which indicated that the stickers were being phased out. But it wasn’t clear that it was only needed till the end of 2013, or that it was needed for its whole life and there just wouldn’t be a new one next time? my daughter moved house and didn’t get either the registration letter or the reminder. She has now been fined $700 for being two weeks past the due date. is there anything she can do about that?